Gaining their popularity from their fairly successful VP3 based AGP Socket-7 entry the P55-VP3, EPoX managed to build on this newly achieved momentum by releasing a second knockout motherboard addressing the needs of the market. 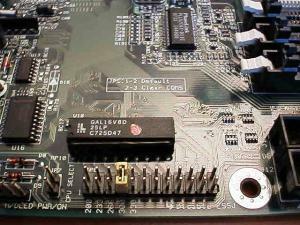 The market demanded a Socket-7 motherboard with AGP support, so EPoX delivered one. The market demanded a LX based Pentium II motherboard with support for EDO SIMMs, so EPoX delivered yet again, this time with the KP6-LA Pentium II board. It is quite obvious that EPoX designed the KP6-LA simply to be a motherboard with average performance, decent stability, and an easy to use setup feature. EPoX never intended the KP6-LA to be a bone shattering performer, nor a first class triumph from their team of engineers, rather a motherboard that provides the user with an option most manufacturers have overlooked: the ability to re-use old EDO SIMMs. 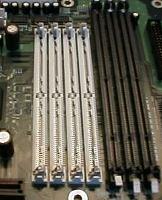 A sight for sore eyes, 4 SIMM slots on a LX motherboard (left). Although neither I nor EPoX recommend the use of EDO SIMMs and Intel's LX Chipset, for those of you not yet ready to upgrade to SDRAM or if you happen to have a large amount of RAM in EDO SIMMs laying around, the KP6-LA may be perfect for you. Intel's specifications for the LX chipset unfortunately (and logically for that matter) do not include support for Fast Page Mode DRAM, meaning if you are considering purchasing the KP6-LA simply because you wish to re-use your old FPM SIMMs, you can forget about it. The only use for the 4 SIMM slots on board the KP6-LA is for making good use of your old EDO SIMMs. The layout EPoX modeled the KP6-LA after is pretty generic when considering LX motherboards out today, however in order to make room for the 4 SIMM slots EPoX equipped the KP6-LA with only 3 DIMM slots. This shouldn't be a problem because if you are interested in going with the KP6-LA using EDO SIMMs should be your first and foremost priority. Along with the 7 memory expansion slots on the KP6-LA, EPoX included a generous 4 PCI and 3 ISA slots in addition to the 1 AGP slot which is nearly a requirement on all LX based Pentium II boards. The documentation of the KP6-LA comes very close to being on par with that of ASUS and AOpen, however still not as close to the manuals of ABIT and Chaintech as we would hope. Like the P55-VP3, EPoX's KP6-LA features the unique E.S.S.J configuration method, making setting up the motherboard for the first time a piece of cake. What is ESSJ? A little known acronym representing a phrase which will soon become EPoX's trademark feature much like ABIT's SoftMenuTM. ESSJ stands for Easy Single Setting Jumper a feature which allows the user to completely configure the CPU Clock speed using a single jumper setting that essentially selects the Bus speed/clock multiplier from a list of predefined settings corresponding to a set clock frequency. By using this feature the user gives up one major option of flexibility, the ability to truly overclock their processor. As long as you have a clock delimited Pentium II 233 or 266 you can easily overclock your chip to 300MHz, however any speeds above that are completely unachievable as a direct result of this. The KP6-LA does allow the user the option of disabling E.S.S.J, however there are still no 75 or 83.3MHz bus speed settings to be enabled. The KP6-LA sports a few hardware monitoring features including CPU Temperature, System Temperature, Fan speed, etc... not excluding the ability to set a CPU Warning Temperature in the BIOS. The AWARD PnP BIOS Setup included with the KP6-LA covers the basic configurable options necessary for any tweaker as well as a few more advanced options all of which are highly configurable. Unfortunately, EPoX did not extend these options to the SDRAM timing configuration section of the Chipset Features Setup offering only two options for the RAS-to-CAS Delay: Fast and Slow. One could hypothesize that these settings correspond to the settings of 2 and 3, however for most users these options are too incredibly vague. It is quite obvious that EPoX never intended the KP6-LA to be used as a high end motherboard for use in server situations however that does not mean that the motherboard isn't stable nor a great performer. Actually an assumption like that would be the opposite of the true case of the KP6-LA. Not only is EPoX's latest entry into the Pentium II market a stable motherboard, but it also proves itself to be a solid performer, producing Winstone 97 scores on par with some of the bigger names in the industry. The KP6-LA is no match for the top of the line AOpen AX6L or ABIT's LX6 however it comes close enough to be considered a threat. 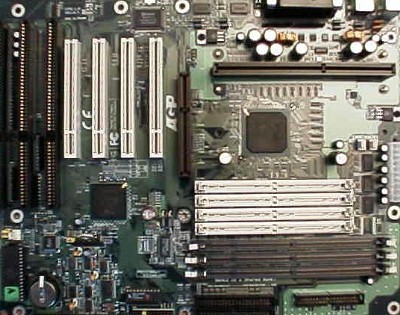 Unfortunately EPoX produced a motherboard with features that the market desired at the cost of options the industry has often taken for granted. Most Pentium II LX boards out today feature support for the 75 and 83.3MHz bus speed, newer ASUS and ABIT motherboards even provide unofficial support for the 100MHz bus speed, however the KP6-LA lacks all of these possibilities for overclocking, making it a motherboard not suitable for a user interested in pushing their system to the limits. Why would you want a KP6-LA? SIMM slots, that's why. However the KP6-LA provided me with some interesting problems when using Micron EDO SIMMs. I couldn't get the test system to boot with Micron EDO SIMMs alone, however when using a SDRAM DIMM in conjunction with those SIMMs the system would boot perfectly. I'm still experimenting with this motherboard and other types of EDO SIMMs so expect an update on the topic shortly.